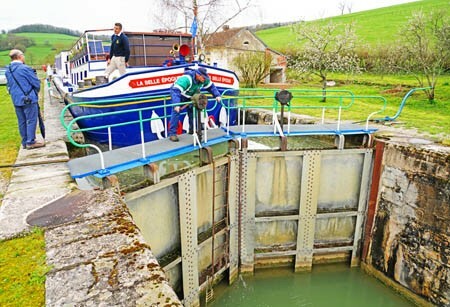 Aboard La Belle Epoque cruising slowly from Venarey-les-Laumes to Montbard this morning. Nine locks are along this section of the canal permitting several opportunities to get off the barge for a walk or a bike ride. Morning cruise of the French countryside on La Belle Epoque. The 12-passenger La Belle Epoque was constructed in 1930 as a freight barge to carry logs from Burgundy to Paris and Amsterdam. In 1973 it was converted into a state of the art luxury hotel barge designed for elegance and passenger comfort, with fully air-conditioned interiors that includes a wood paneled salon, dining area, and spacious cabins with marble en-suite facilities. A spa pool, sun deck, twelve bicycles for riding alongside the canal, and a well-stocked open bar with complimentary wine, spirits, beer, and soft drinks are located topside. Complimentary Wi-Fi is available throughout the ship. Freight barges began becoming repurposed as hotel barges when they became uncompetitive with railroads and fell into disuse in the 1960s. Some can hold up to 20 passengers but they are limited in size by the width of the canals on which they navigate. With only a few inches clearance in locks on both sides the flat-bottomed barges are very stable as they slowly move along. 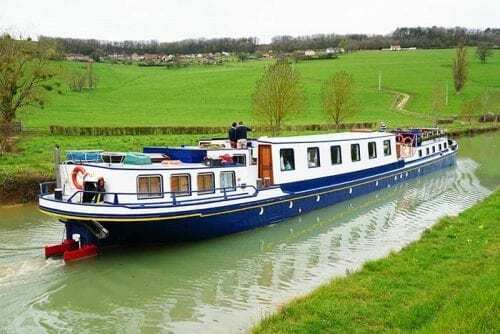 On our cruise today following lunch, Captain Jolanda and Luke drove our group to the Chateau de Commarin to be hosted by the 26th generation owner Count Bertrand de Vogue. In the family since the 13th century, the chateau has a rich history architecturally as well as for famous visitors such as Queen Elizabeth of England. Commarin is known for its decorative collection of family heraldic tapestries from the 16th century. Most recently the chateau gained fame for a television special featuring the Count’s two minipigs thus ironically drawing more visitors to view the pigs than the castle. Guided tours for both are available daily from April through November and our’s is the first group to visit this season. Count Bertrand, the Chateau Kitchen, and one of “Les Garcons” minipigs ignoring the playful 10 month-old brown Lab puppy Oscar. 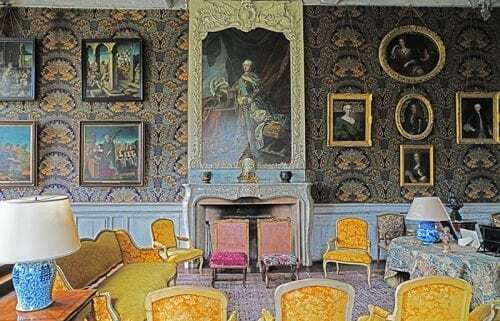 “Family photos” in the parlour of Chateau de Commarin. We were also privileged to be the first group to witness a private demonstration of Birds of Prey conducted by Maude and Julien Domingues, a couple who raise and train kestrels, hawks and owls. Visitors were encouraged to participate with the birds, including some stunts with a Harris Hawk flying between Bill and Mike from our group. 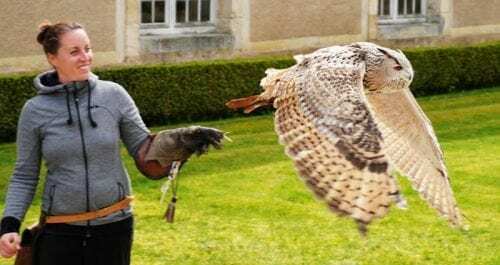 Birds of Prey trainer Maude Domingues with eagle owl in flight. Julien demonstrating tricks with a Harris Hawk. After a very busy afternoon, returning to the barge for another delightful dinner prepared by Chef Bryan was greatly appreciated.